It has been so long since I read romance with a bit of suspense in it, I do not know why really since I enjoy the subgenre. Even if this was more military romance. The book is not so action packed that you might think at first glance, there is of course action. But it's also of course about the tension between Kee and Archie, the budding romance and, well I can't tell you that. Another part of the book is "a project", so not to spoil it all. It shows Kee's soft side and we get under her skin. I got to appreciate here and the whole "project" is more drama, so no suspense there. I know, I am being very vague. Then there is the action part, and that part actually had me a bit sad too. I understood the bad guys and their mission so I was on the fence. It was a sad affair. The characters then, Archie was sweet, Kee was tough, but they worked together, they just worked and I liked them both. This is actually book 2 in a series but that does not matter as Kee is the new girl and this is her book. But the pilot of the chopper she is on had her own book (book 1). Which does sound like an interesting story to read too. There was a nice mix of action and romance, quiet life, and how fast you have to move when you are in in the danger zone. It did make me want to read book 1 too. This was a romance set in the Afghan desert, 2 soldiers falling in love in the midst of gunfire and smoke. Romance with an action packed side to it, smokin' hot. I picked this one up yesterday so I am super glad that you liked it :) I picked up the first one too! I do hope you'll enjoy it too then! Sounds like a nice mix of romance and action. Nice review! I wouldn't have thought there was this much romance within it. Hm... curious now. I haven't read a military romance (well, where both are in the military) yet. A nice mix of romance and action sounds great. Glad that you enjoyed. Great review, you sure made me curious about the book. 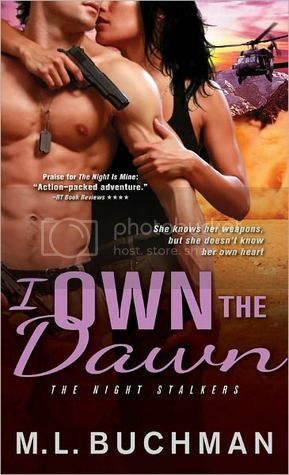 I don't believe I have ever read militairy romantic suspense before. I like the cover & that it has action in it! Who doesn't love a bit of action, right? ok now I'm curious to read your opinion about book 1. It's nice to have a romance/action book, I like it as well. Yes! I love romantic suspense with a lot of sexual tension between the characters. I'll have to add this one to my list. As to military romantic suspense and not having read one, what shocks me is that I wrote one! I've written SF/F & a thriller, a couple of historical romances that were okay, a contemporary that's selling nicely... and then I got jumped one night by the "Night Stalkers" series. It required an immense amount of research to try and make both the settings and the characters realistic, but they held me at bay until I wrote their story, and it turned into my first national sale. You've gotta watch out for those characters. They're sneaky!